At! At! At! | Spaceship! Spaceship! Spaceship! We take our spaceships-only policy very seriously; and it’s not infrequently that something comes along so heartbreakingly astounding it practically demands to be blogged; but it’s inconveniently a mecha/rover/sausage or something. Fortunately this amazing dio by GolPlaysWithLego has snowspeeders in it, which are spaceships, right (RIGHT?!) so it’s fair game. This is the third version he’s built, and it’s evolving into a very, very nice model. 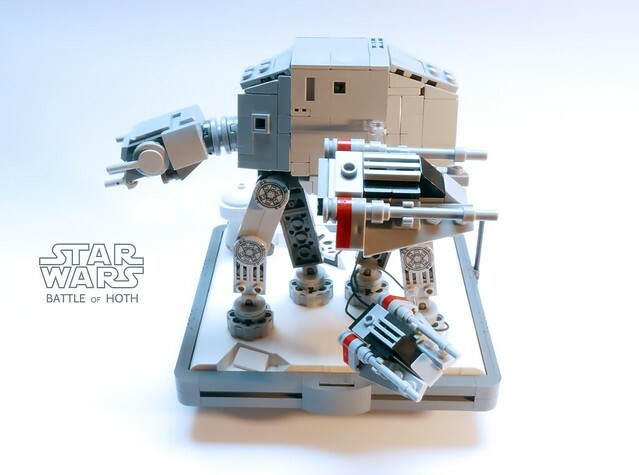 The amount of detail he’s crammed into this tiny AT-AT is incredible and the presentation on the Hoth diorama with little trench details is amazing. The perfect little mini snowspeeders posed in action just pushes it over the edge! This entry was tagged maybe not a spaceship, microscale, MOC, star wars. Bookmark the permalink.